With some easily sourced items, you can create unique and a Fanciful DIY Bird Feeder for you or to give as gifts this spring. I’m sure, like mine, your local thrift, Goodwill and Re-Store shops always have a fair inventory of pre-loved silver-plate pieces. I picked up both of these pieces for $10.00. The tags claimed they were ‘mayonnaise bowls’. I had never heard of silver-plate mayonnaise bowls, but what do I know. I guess there are, or at least there were, folks who serve their mayonnaise in silver or silver-plate bowls. Guess that’s what makes the world go around. After picking up these pieces, I hightailed it to my Home Depot in search of some sort of something to use as a pole to place the bowls on. I settled on copper tubes…I like the mixed-metals thing. I consulted with my friendly Home Depot employee and ended up with all the items I would need to create my fanciful DIY bird feeder. ¾ “ copper tube/pipe. My tube was cut to 5’. Find the center of the bottom of your vessel. We measured the diameter and drew it on the bottom of our vessel with a sharpie. Then we marked halfway on the diameter line and drew a perpendicular line through the first line. While this method would probably not be endorsed by my High School geometry teacher, it worked perfectly for us. 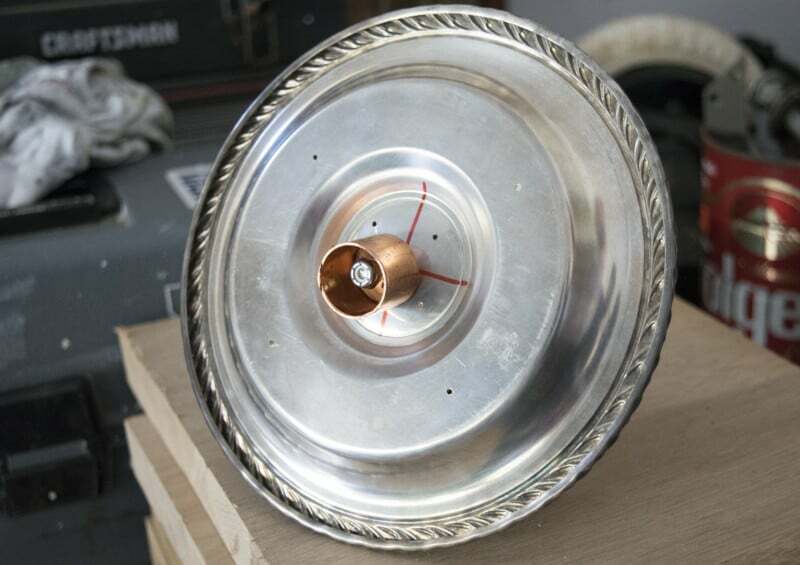 The silver was soft enough that we did not need to drill pilot or guide holes on it. We used the large drill bit for the hole in the middle of the bowl. We also used the smaller drill bit and drilled holes through the bowl and the saucer so that any rain would drain through. Drilling through the copper cap was a little more difficult. The method that worked best for us was to place it in our vise, with wood pieces on either side to protect it from getting damaged. 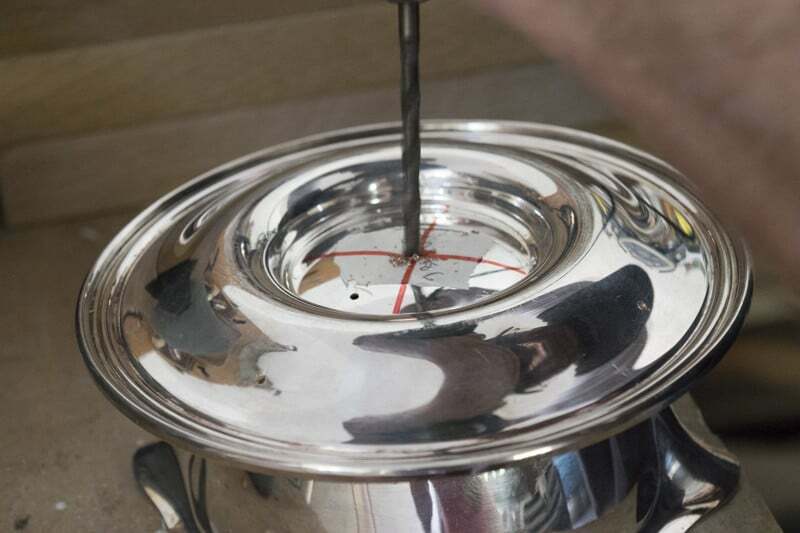 You will definitely need to drill a pilot hole using your smaller drill bit. Once that’s through your cap, switch to your larger drill bit. 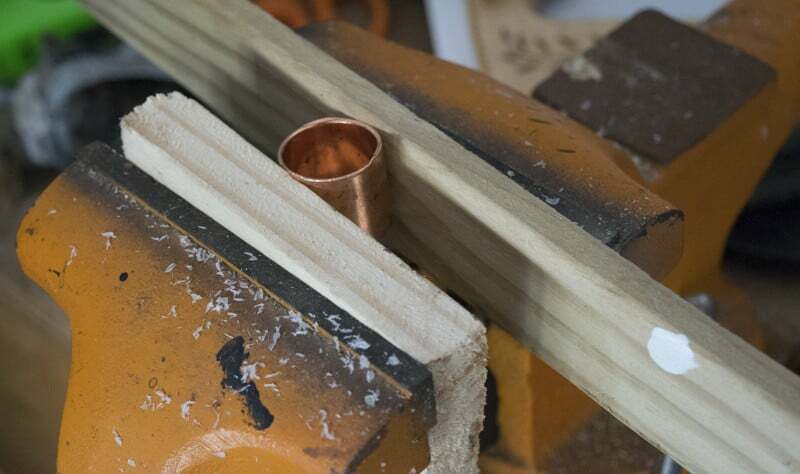 WORD TO THE WISE: COPPER HAS A HIGH THERMAL CONDUCTIVITY WHICH MEANS….IT GET REALLY HOT WHILE BEING DRILLED. Terry has a blister on his finger to prove it. Once you have all your holes drilled, it’s just a matter of attaching the end cap to the bowl. I placed a washer between the screw head and the bowl. Then placed the end cap on the bottom of the bowl and placed a nut on the screw. Screwing the two pieces together was a two-person job for us. One of us held the nut that was in the end cap with pliers while the other one screwed the screw in. Then we just placed the end cap on the pipe/tube. I didn’t glue the cap on the pipe, but if I need to I can go back and add glue. I was perfectly happy with the bird feeder at this point, but I have had this copper ivy garland for years and thought it’d be a great adornment on my bird feed. Truthfully, I think I got it the same time I got the copper topper and patina green paint that I used for my bunny. It’s been lying around all this time, trying to find its purpose. I think it finally has! I did search the internet to see if I could find a similar garland but came up empty-handed. If you would like to add something else, you could use some copper wire. You could twist it into a curly cue and attach it. So there you go! 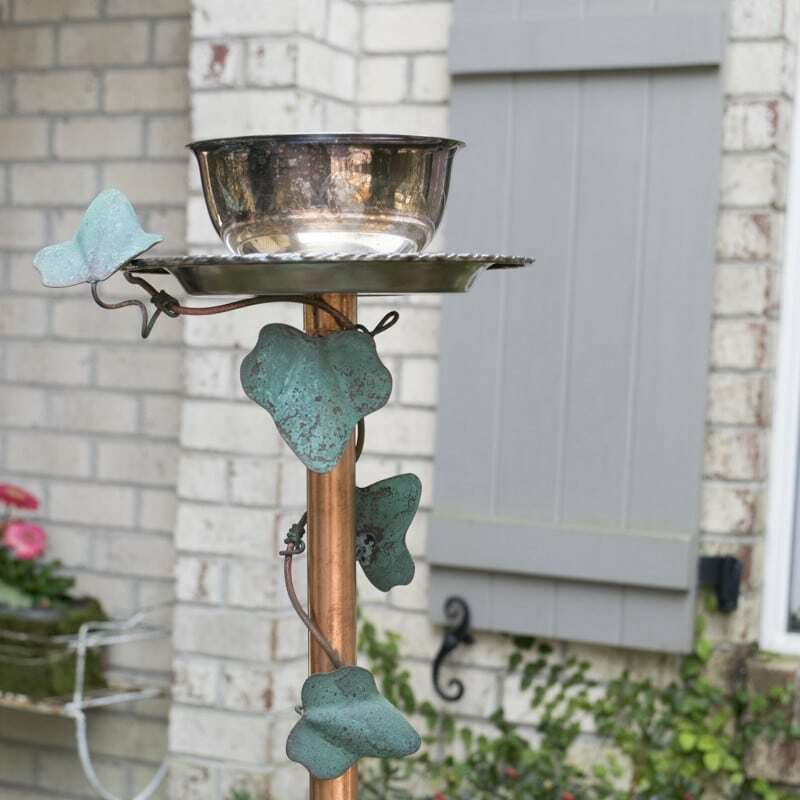 Once you have your materials this fanciful DIY bird feeder is so quick and easy to put together. Start to finish I think it took ½ an hour to assemble the bird feeder. In half and hour you would have a great Mother’s Day gift, birthday gift, housewarming gift or a just-because gift. I really do appreciate your company more than you’ll ever know and hope you’ll stop by again soon. If you want to make sure you don’t miss future content, pop your email in the beige box up on the right. I usually send out 2-3 emails a week, so I won’t inundate your inbox. Right now, subscribers to Nourish and Nestle will receive a free, downloadable Measuring Equivalents Chart overlaid on a watercolor lemon. You can see it here. Sign up to our email list (on my right sidebar) and we’ll send it to your inbox within 24 hours! If you are already a subscriber and would like a lemon measuring equivalents chart, send us an email with ‘lemon chart’ in the subject line and we’ll send you one too! It is beautiful but I see a problem if it rains. Maybe drain holes should have been drilled so the seeds don’t swim? Thanks for your kind comments and we are actually of the same mind! We did drill some small holes in both the saucer and the bowl so that rain would run through. You can see them on the photos of the bird feeder under construction They are pretty tiny! Great minds think alike! Hi Jenny…it was so easy to make! I love an easy project, don’t you? Hope you find some great thrift store finds to make one too. I LOVE this, Lynn – you are just so talented and make everything look so easy! Aw Sarah, you are too kind. 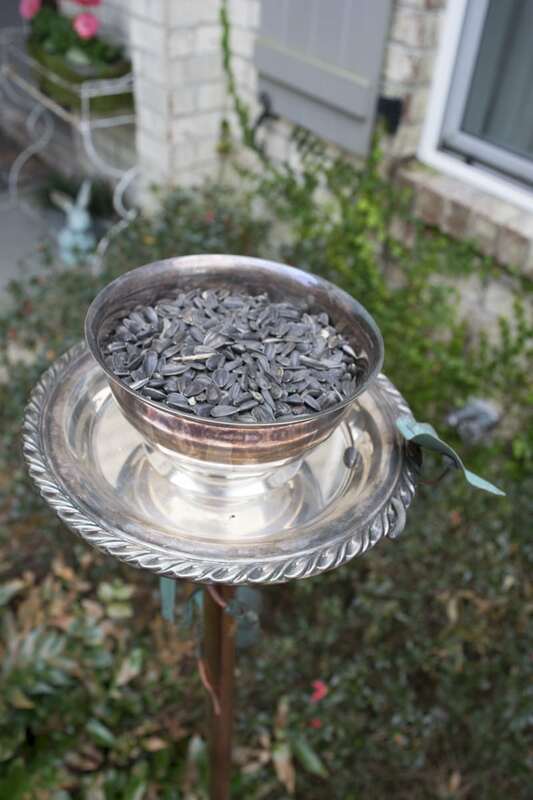 This bird feeder was really so very easy. 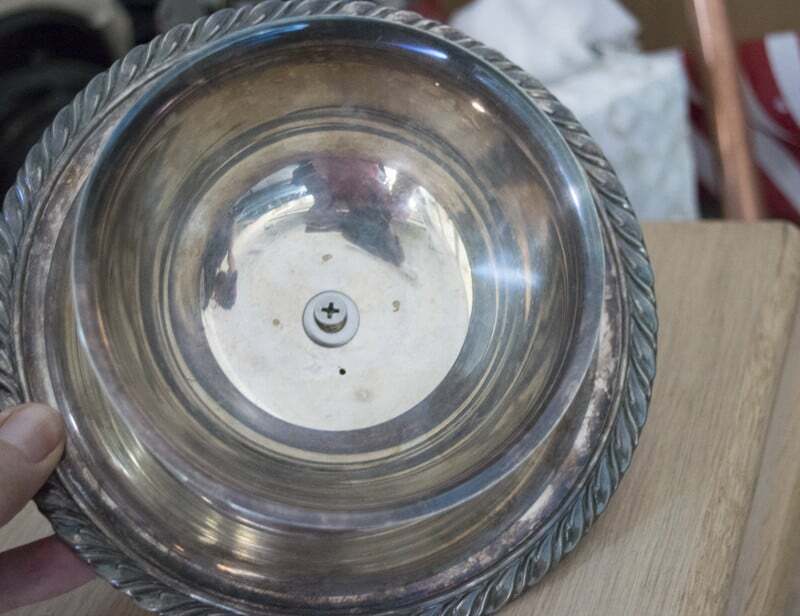 The hardest part was finding the the silverplate ‘vessel’ which required going to thrift stores which is really rather fun! Thanks so much for swinging by and leaving your kind comments. Completely agree with you Mary…I’ll opt for birdseed over mayonnaise any day! And I am tickled that I held on to that garland all those years…see, my decluttering really had lasting end results! As always, I so appreciate you swinging by and leaving your kind comments. This is a great idea, Lynn! Just wondering if you have issues with the squirrels? Our squirrels are so brazen that they come up to our second story deck to get to our bird feeders that are hanging out from the railings. I’m always on squirrel watch for our feathered friends. Hi Carol, yes, we do have brazen squirrels as well and I’ve ceded to them on this feeder. While I would prefer the birds, it’s rather fun to watch them scale the pole and nibble away as well…and luckily birdseed is cheap. Thanks for swinging by today! Lynn, we are getting lily and tulip starts, they look so pretty and green against the brown mulch and brown grass! And this week the mourning dove is back! Spring is coming! 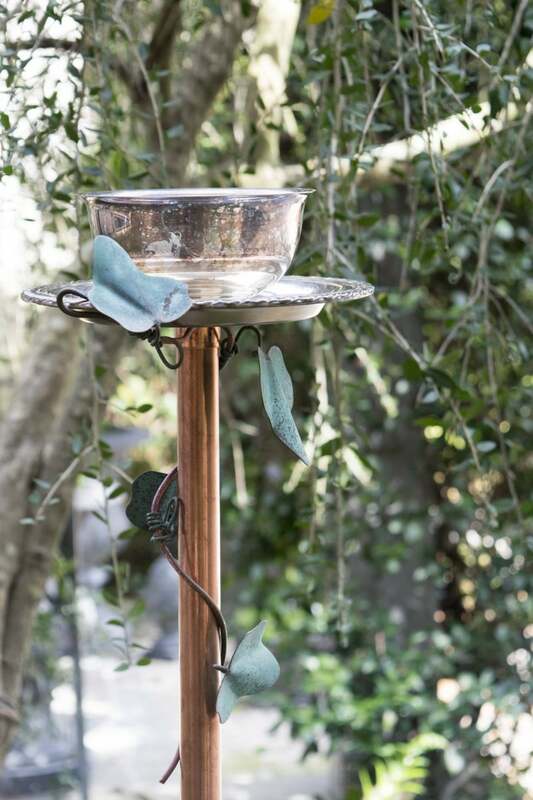 I love having bird feeders and hummingbird feeders in the garden, we love to watch the birds, and it helps to keep them out of my garden! I am going to look at the thrift shop for mayo bowls, lol, or some like these, I love how they look!!! Yippee…it always nourishes my soul to see the beginnings of spring! So glad it’s popping up in your world. Hope you find some sort of ‘vessel’ for bird seed…the thrift store shopping is always fun! Always appreciate you swinging by with your kind comments. 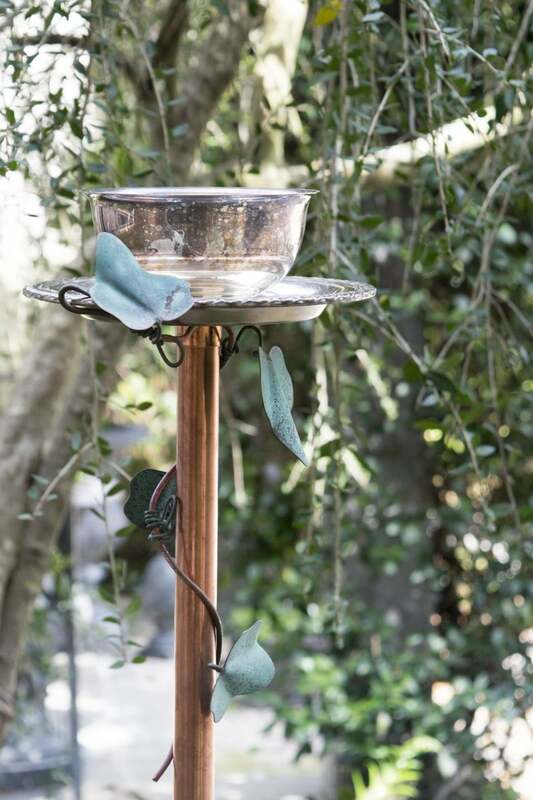 This bird feeder is beautiful. My boys and I love listening to the birds singing in the morning. Hi Rachel…the elevation of our home is such that I really only have 2 windows that I can see a bird feeder from, and that’s where I have this one. I’m loving having the birds gathering in the tree near the feeder and chirping away and then taking turns at the feeder. It really is just perfect! I love your birdfeeder Lynn! It is so pretty! I really like the way you added the copper vine to the pole. I will have to make me some like this, if it’s tall enough I wouldn’t have to worry about the squirrels get the bird seed like they do with the feeders in the trees. Don’t think that they could climb the copper pipe. But they are tricky little things. Thanks Linda…I’m pleased with the way it turned out as well. But I have to be honest…the squirrels don’t seem to have any problem. 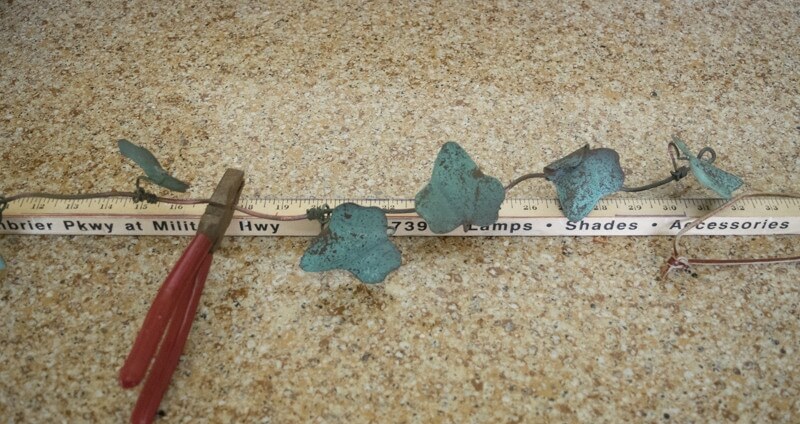 Not sure if they are climbing the copper or jumping from nearby trees, but they are surely finding their way. I’ve rather surrendered to the critters truthfully. I love these and they would go right along with teacups that I have mounted on rebar rods! 🙂 Thanks! Hi Beth Ann…wouldn’t it be great to have a whole set of teacups and serving pieces scattered throughout your yard…The birds (and squirrels) would have a ball and it’d be great fun to look at as well. Thanks for swinging by today. Gorgeous! Your birds must be feeling pretty posh. The silver just brings a whole new level sophistication to the beginning of spring. Your feeder is lovely. I’ve never seen another one like it! Aw thanks Kathryn…think my birds are sitting pretty at the moment…well, as long as the squirrels let them at the feeder! I’ve placed it right in front of a window so that we all enjoy seeing them flying in and out. This is so beautiful! It’s hard to believe that you made this and didn’t spend a ton of money on it at some fancy store. I love the copper! Hi Jessica…I love that it was pretty economically sourced…and I think I could actually do it cheaper by buying one long copper pipe and cutting it in half. If I do it again that’s what I’ll do. Thaks for coming by to visit today. Lynn, this is the classiest bird feeder that I’ve ever seen. I know that as soon as I have a yard, I will definitely make one. It’d be the perfect background to an outdoor tea party!!! Thanks Gina…it’s pretty fun to look and see the birds sitting in the ‘mayonnaise bowl’…who’d a thunk it!? Love the outdoor tea party image. Beautiful! Lynn, I love those silver plated mayonnaise bowls! Your bird feeder turned out great. Hey Cathy…had you ever heard of a mayonnaise bowl before? Think it’s a hoot that it was actually labelled that. Thanks for swinging by. This is gorgeous and pretty simple to put together. Great post. Hi Candace, so easy to put together but I have so enjoyed having it right outside of my window. Watching the birds come and go (as well as the occasional squirrel) is so relaxing. Thanks for swinging by today. Love this! I would have never thought to do this. You did such a great job! Thanks Crystal! A really easy project and done that I”m really enjoying from my window on a daily basis. Just watching the birds come and go is very blood pressure reducing. Hi Ilka! So glad you didn’t go to SPAm! ? I’m with you…I could sit and watch the birds come and go from the bird feeder for hours…me, my kitty Puddles and my pup Flora! It is mesmerizing. I do love the feeder and made another to give to my mom for Mother’s Day (hope she’s not reading the comments!). Wishing you a lovely weekend. 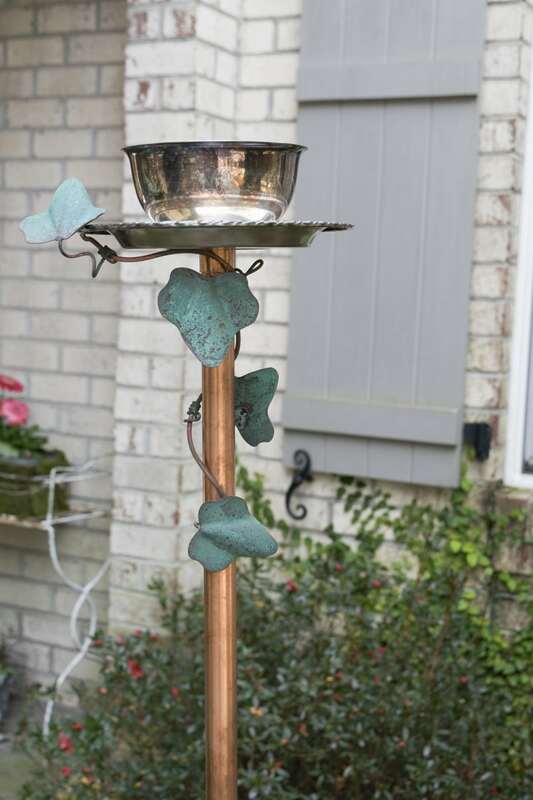 Lynn, I’m featuring your awesome bird feeder this weekend at the DIY Sunday Showcase party – love it! I raced over to see the birds at the feeder because the wings looked so round and smooth. Could it be a breed I don’t know? Wow, my eyes!! !Time to get my glasses renewed! But so pleased I stopped in to “see” your DIY feeder! It’s gorgeous! Thank you for sharing!!! Hi Robin…Did you ever figure out what kind of bird it was? The primary visitors to my feeder are cardinals and titmice…and of course, squirrels. I am so glad you enjoyed my feeder and I so appreciate you stopping by today with your kind words. Great idea but I have a question. Do you put the copper pipe into the ground or is it weighted down with something? ? Jeanette…I don’t know how I missed your question! I am so sorry. I just pushed the copper pipe well into the ground, twisting it as it went in to make sure it was deep enough and stable.It has been several months now and it it holding up well. 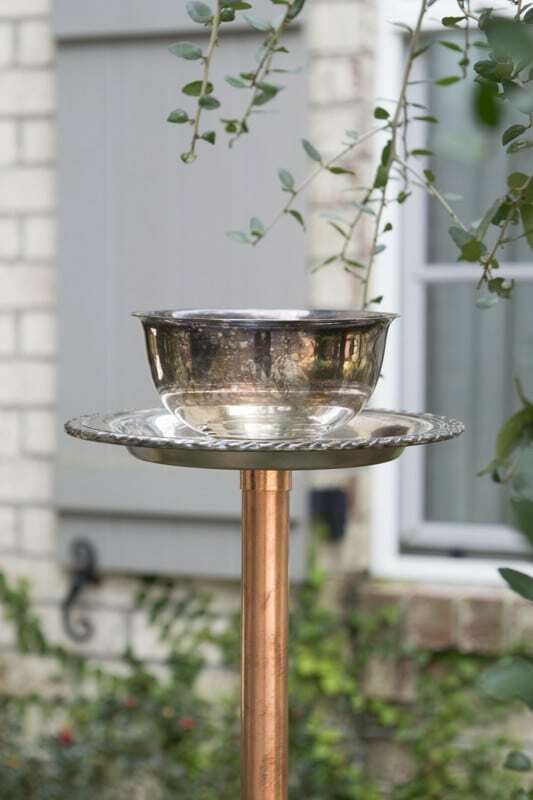 I will say that it is visited frequently by squirrels and their weight does knock it off center a bit, but I just straighten it when I refill it. Once again, I am so sorry for the late response!